The pathologist determines the histologic diagnosis of the trophoblastic disease; most importantly, if choriocarcinoma is present. 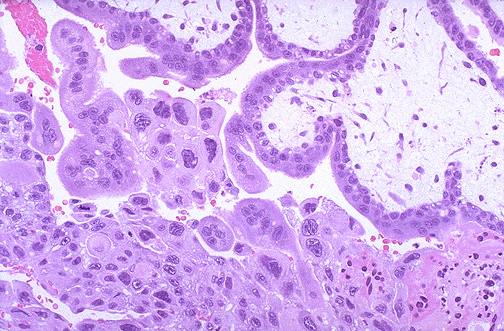 In this complete hydatidiform mole shown here there is atypical trophoblastic proliferation, but chorionic villi are still present. The patient is then followed with serial serum HCG levels after evacuation of the mole to make sure there is no residual trophoblastic disease. A small number of complete moles are followed by development of invasive mole or a choriocarcinoma.